The best feature of an Android phone perhaps is the option it offers its users to use text messaging apps. An Android phone is built with text messaging application but Android does not just stop from there, it gives users a wider range of choices for text messaging, depending on the user’s preferences and needs. There are users who want to use a text messaging app that is plain and minimal. There are users who like using emojis and gifs in messages. 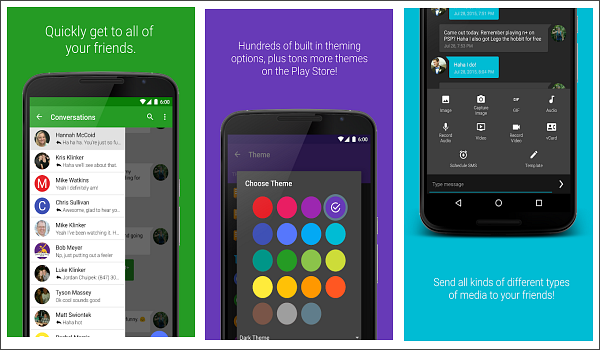 Whatever preference you have when it comes to messaging, Android offers you a lot of choices. Sometimes users do not even know which text messaging app to use anymore. But don’t worry, we filtered them all for you. In this article, we will discuss the best text messaging apps for Android. Android Messages is the official messaging app of Android. It offers SMS, and MMS sending. You can message anyone from anywhere. This app is reliable. 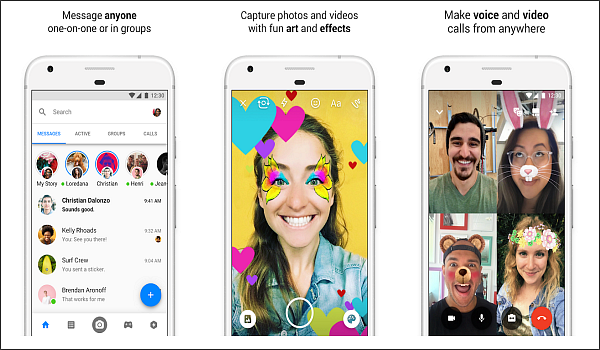 Some of the great features of this messaging app for Android is that it can send a group text, share pictures, videos, and audios. It makes communicating with family and friends more convenient because of its clean design. It also makes searching through past conversations and message threads easier with its powerful search feature. 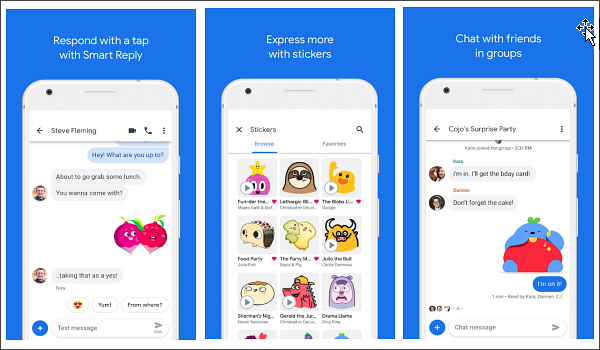 What’s more, Google recently launched Messages for web that allows Android phone users to send and receive text messages from any web browser. If you want an alternative to the official Android messages app, you can checkout Textra SMS. It is one of the best texting app for Android that offers something extra. It is beautifully designed but also customizable. This messaging app might come with a lot of great features but our favorite among what it offers is that we can use it quick and fast. Some of the other great features include the 180 design theme you can use, bubble and icons, light, dark and night mode, scheduling messages on Android, slide to delete or call, quick reply pop-up, group messaging, etc. One of the useful features of this app is it allows you to stop the message after you hit send. You know in case you accidentally sent a text to someone. Aside from the fun feature, this app is very functional with the feature that supports dual sim for Android 5.1 and above. The features we have enumerated are available for you to use for free. Chomp SMS takes pride in the customizability of the app. It can help you create a unique text messaging experience from the 100 themes you can choose from without a fee. It offers a variety of features such as passcode app lock, scheduling of SMS, pin favorite texts, backup, signatures, quick reply popup, dual sim, group messaging, stop a message after sending, and privacy options. The user can customize this messaging app’s notification icon, ringtone, screen color, font size, background colors, and vibration patterns. If you are the type who uses emoji a lot, Chomp SMS offers an endless choice of emoji you can send for any type of messages. Mood Messenger is highly recommended by users and is probably one the highest rated alternative to Android messaging app. Users are free to enjoy the app without ads and without a fee. Perhaps the best feature is the typing indicator for the user to know if the other person is typing. 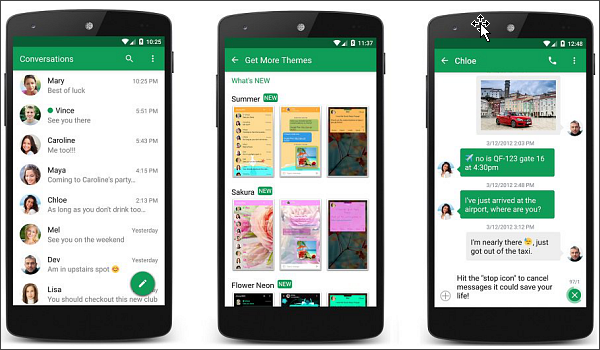 Just like other popular messaging apps, this one can also be customized according to the users’ preference. It comes with bubble shapes and colors, background and overtimes, fonts and sizes, notifications including LED, sounds, vibration, and format. You can also choose from animated emojis if you want to add more fun to your messages. Another important feature of this app is the encryption, dual sim, pin for important messages, location sharing, and scheduling messages. Facebook Messenger for Android promises to connect you to people in a free, fast and secure way. You can sync your contacts to your Facebook friends and search names on the app itself. You can use this app on mobile devices and your desktop. Perhaps what makes Facebook Messenger a favorite is it allows you to connect with people all over the world, for free. You can share pictures, start a video call, send audio and play games. This messaging apps group messaging feature is beneficial for a group of friends who want to catch up. You can change nicknames, colors, and photos. This free text message app is also used by businesses to reach out to their customers. You can communicate with businesses for customer queries including check a store’s operation hours, follow up on orders and request their location. 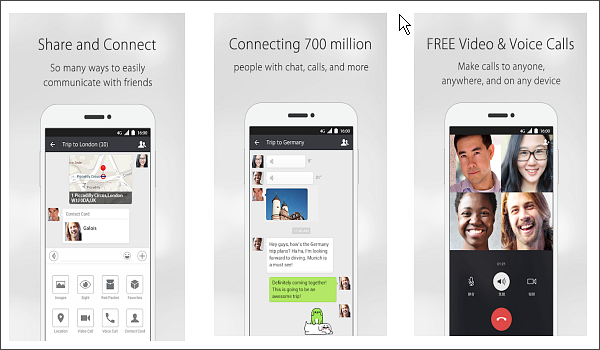 WeChat is a popular messaging app for Android. It is more user-friendly, people say. Some also love that it is very simple to use but also versatile enough to satisfy the needs of its users. It is not just a text messaging app but an app that also lets you make calls to your family and friends wherever you are in the world. It is basically an all in one communication app. You can send SMS/MMS, voice and video call, share photos, play games, create moments. Its group messaging can create a chat group for up to 500 people. You can also use Friend Radar or People Nearby to meet people near your location. The app also supports 20 languages and can translate languages. What bring WeChat to the top of the Android messaging app list is because of its high value towards their users’ privacy. Evolve SMS is one of the best SMS app for Android that makes texting quick and more fun. It is beautifully designed and packed with beneficial features. Are you tired of the boring plain text messaging app? EvolveSMS can be customized using the themes and notifications. It is fast and unique. You can reply quickly to people’s messages because of the simple interface. It also comes with a powerful media support that allows you to send pictures, videos, audio, gif, and contact details. 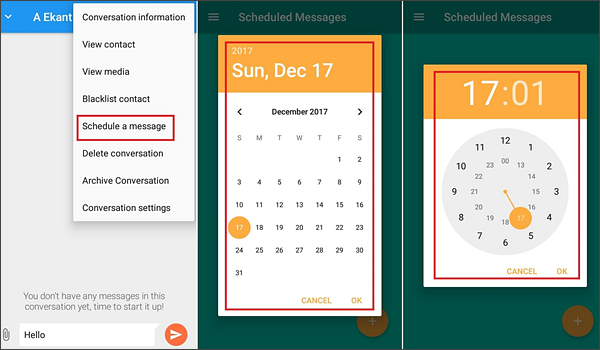 This free Android messages app also allows you to delete messages by batch, supports dual sim, protect your inbox with a password, archive messages and more. 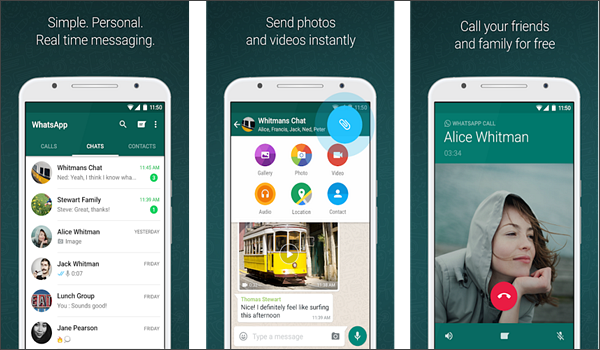 WhatsApp Messenger, just like most of the text messaging apps for Android, is free and easy to use. The app uses the internet connection to let you make calls and send messages. This messaging app for Android has one of the most exciting multimedia support. It allows you to send and receive photos, voice messages, documents, etc. If you want to save on calls, especially when traveling to other countries, WhatsApp is the best choice. It even allows you to call an emergency. One of the unique features of WhatsApp Messenger is that it connects using your phone number. The app will not ask you to create a username, instead, you can use your phone number. 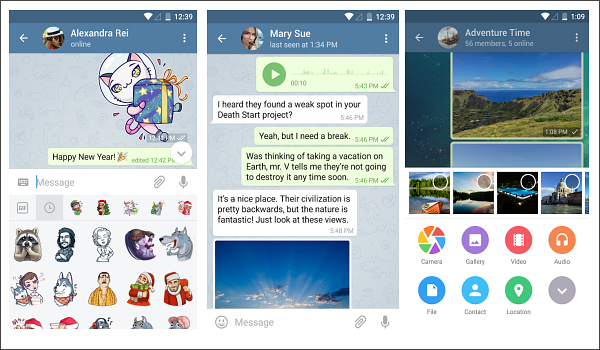 Telegram promises a simple, secure and fast messaging app for Android phone. It can be synced to all your devices. The app boasts the 200 million users they currently have. It also allows you to send videos, audios, and pictures without limiting the type and size of the file. If your phone runs out of space, the messages will be automatically stored on the app’s cloud storage. Users also do not have to worry about their privacy because this app is encrypted. The group chat feature is impressive and incredible offering a capacity of up to 100,000 members. You can also setup bots, to help manage the groups you have created. With all these powerful features, Telegram is for free and will not annoy you with pop up ads. 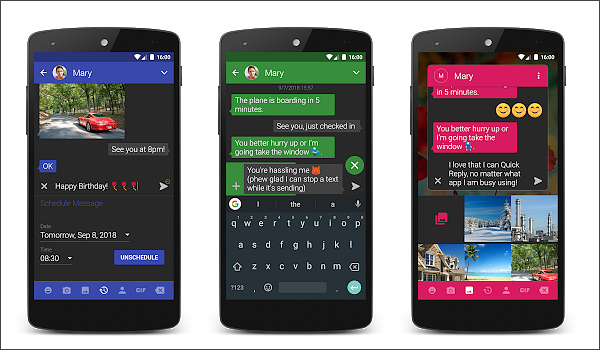 Pulse SMS is the future of text messaging app for Android phones. It is beautiful, fast and secure. Users are also given a vast option to customize. It even makes your messages available on all your devices. When you send a message, you are using your phone number. 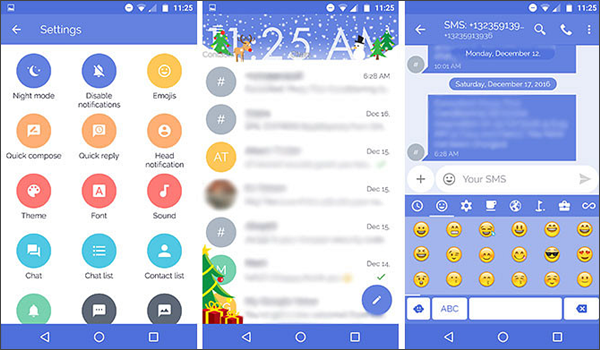 Some of the features available are animations, themes, password protection, private conversations, schedule messages, search for messages and threads, backup for messages, weblink preview, dual sim support, encryption and more. You can purchase the free version, or add a few bucks for more features. Whatever your text messaging habit is, there is basically a text messaging app for an Android phone you can get. What is great is that their apps are mostly for free, and they work amazingly. 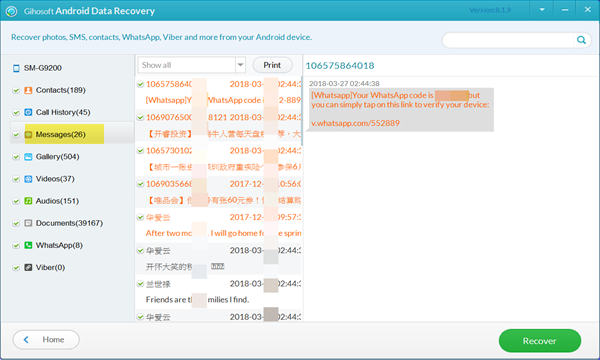 If you have previously backed up messages, you can retrieve them directly from the backup file; In case you have no backup, there is another option here, which is to use a third-party data recovery software like Gihosoft Free Android Data Recovery, to scan and retrieve deleted messages from Android. It supports multiple data types and loss scenarios, you can get it by clicking the below button.